In Gianna Beretta Molla, we meet a truly contemporary and ‘ordinary’ woman… She liked fashionable clothes, valued education and enjoyed the arts. She truly loved life, and it is through the context of this life, deeply rooted in the things of God, that the sanctity of this contemporary woman is made tangible. Pope John Paul II described Gianna as “a woman of exceptional love, an outstanding wife and mother, Gianna Molla gave witness in her daily life to the demanding values of the Gospel.” The story of this remarkable woman has spread quickly throughout the world. Gianna was born to Alberto and Maria Beretta in Magenta, Italy, on October 4, 1922. She was baptized in the Basilica of San Martino. Gianna received her first Eucharist in April of 1928. Her older sister, Amelia, prepared Gianna to receive this sacrament, and from then on, Gianna attended daily mass with her mother. Gianna experienced a series of losses early in her life. In 1937, her sister, Amelia, died at the age of twenty-six. Following the death of his daughter, Alberto Beretta decided to move the family to Genoa, as three of the children, including Gianna, were attending university there. Then in 1942, both of Gianna’s parents died, four months apart from each other. Gianna was only twenty years old at the time. Gianna persevered in her studies. In 1942, she began attending university in Milan. She devoted her time to her studies, her involvement in Catholic Action and the formation of youth, and also enjoyed spending her vacation time at the family cottage in Viggiona. Two of her brothers were ordained to the priesthood. One of them, Father Alberto, was a missionary in Brazil. Gianna longed to go with him and work as a missionary. However, due to certain health challenges, she realized that this was not to be. Gianna met Pietro Molla for the first time in 1949. It was just before she opened a medical clinic in the small town of Mesero – across the street from Pietro’s parents’ home. She drove her Fiat 500 from Magenta to Mesero every day after attending mass. In December of 1954, Gianna and Pietro began their courtship. On September 24, 1955, Gianna and Pietro were married at the Basilica of Saint Martin in Magenta. In July of 1959, a third child, Laura, was born. Gianna was always overdue in her deliveries, and was quite ill with morning sickness during her pregnancies. She suffered two miscarriages after Laura’s birth. In September of 1961, Gianna underwent surgery to remove a uterine tumour during her fourth pregnancy. On April 21, 1962, Gianna Emanuela was born by Caesarian section. One week later, Gianna Beretta Molla died of peritonitis at the age of thirty-nine. During Gianna’s pregnancy with her fourth child, she made the decision to save her child’s life, at all costs. This decision ultimately led to her death. In the second month of her fourth pregnancy, Gianna was diagnosed with a large tumour in her uterus. Gianna’s tumour (a fibroid), though benign, was large and painful. It threatened the development of the baby and even threatened the continuation of the pregnancy. Gianna began having bleeding, so a decision regarding surgery was urgent. Gianna had three options. She could have the fibroid removed by also removing her uterus (hysterectomy). This would cause the death of her two month old fetus and eliminate the possibility of future pregnancies. A second option was to remove the fibroid and terminate the pregnancy. The last option was to remove the fibroid and continue the pregnancy. This was the only option to save her unborn child, but the risk of pregnancy-related complications was very high. Against standard medical advice, Gianna chose the third option. She underwent surgery on September 6, 1961. She recovered well and her pregnancy continued. At the end of her pregnancy, labor could not be induced, so her baby had to be delivered by Caesarian section. A healthy baby girl, Gianna Emanuela, was born on April 21, 1962. Very soon after the delivery, Gianna began having increasing abdominal pain and fever. She was diagnosed with septic peritonitis (an infection of the lining of her abdomen). She received all the known treatments of that time – antibiotics and transfusions for the infection, which was likely a complication of the caesarian section surgery. Despite their efforts, Gianna could not be saved. Gianna died on April 28, 1962, seven days after the birth of her child. Gianna never considered the possibility of aborting her child. She also repeatedly made it clear that if only one life could be saved, it should be the baby’s life. The heroic part of what Gianna did was to choose life for her child under difficult and uncertain circumstances, no matter the consequences to herself. Canonization is the process the Church follows to name a saint. In the early years of the church, saints were chosen by public acclaim. Though this was a more democratic way to recognize saints, some saints’ stories were distorted by legend and some never existed. Over time, the bishops and the Vatican became responsible for this decision. The process begins after the death of a Catholic whom people regard as holy. The local bishop investigates the candidate’s life and writings for heroic virtue. Then a panel of theologians at the Vatican evaluates the candidate. After approval by the panel and cardinals of the Congregation for the Causes of Saints, the Pope proclaims the candidate “venerable”. In Gianna’s case, Cardinal Giovanni Colombo, Archbishop of Milan, began promoting the cause for her beatification on November 6, 1972. On April 28, 1980, the cause for beatification of the servant of God, Gianna Beretta Molla, was officially introduced by the decree of Cardinal Carlo Maria Martini, Archbishop of Milan. Between June 1980 and January 1984, the investigation of Gianna Beretta Molla in Milan and Bergamo, Italy, included over 170 sessions with more than sixty witnesses, including priests, religious women, medical professionals and Gianna’s family. Between April and November of 1986, the Congregation for the Causes of Saints reviewed the four volume (2570 pages) investigation results, and issued the Decree of Validity for Gianna Beretta Molla. 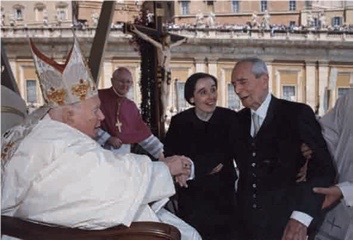 On July 6, 1991, the Congregation for the Causes of Saints confirmed and Pope John Paul II decreed that the heroic virtues of the Servant of God, Gianna Beretta Molla, be recognized. Gianna Beretta Molla received the title of “Venerable”. Two miracles have officially been attributed to the intercession of Gianna Beretta Molla, and both miracles took place in Brazil. Fr. Alberto, one of St. Gianna’s brothers, and also a physician, was a Capuchin missionary in Brazil. He cared for the needy and regularly wrote to his sister about the work in the mission. She had a strong desire to join him. After completing her studies and contemplating going to Brazil, her spiritual director raised concerns around her health and the gruelling life of missionary work. He counselled against the idea, as did the Bishop of Bergamo. Gianna accepted that God had other plans for her and began her medical practice in Italy. On October 22, 1977, Lucia Sylvia Cirilo, a 27 year old Brazilian Protestant woman, gave birth to her fourth child, a still born baby, via caesarian section. She was discharged from the hospital 9 days later in good health, but a few days later she returned to the hospital as a result of severe pain. Doctors found a very serious complication had caused a rectal-vaginal fistula. It was inoperable in that hospital, and the nearest viable facility was more than 600 km away. Since Lucia was unlikely to survive the trip, a nurse, Sr. Bernardina, who was a Capuchin religious, invited two other nurses to join her in intercessory prayer to Gianna Beretta Molla. Gazing at a small picture of the Servant of God, Sr. Bernadina prayed “You who are Father Alberto’s sister, make this fistula heal and keep this woman from having to travel to Sao Luis.” According to the young mother’s testimony, her pain subsided immediately and disappeared completely. An examination by the surgeon revealed that the fistula had healed, and it was no longer necessary to transfer the young woman. On May 22, 1992, following years of investigation and verification, the cure was recognized by the Special Congress of the Congregation of the Causes of Saints, as a third degree miracle. In mid November 1999, Elizabeth Comarini Arcolino, a 35 year old Brazilian woman, was pregnant with her fourth child. Within the first month, she had a serious hemorrhage. In spite of this, the pregnancy continued, but an ultrasound showed abnormalities, and doctors did not hold much hope for a full-term pregnancy. On December 9, a further complication occurred in the form of a large blood clot. Ten days later, doctors found the baby’s heart was still beating, but the placenta was very deteriorated. Elizabeth’s physician said the baby was barely alive due to the size of the blood clot and it was almost certain that she would spontaneously abort. Contrary to these expectations, the pregnancy continued. In February, Elizabeth returned to the hospital feeling something was wrong, only to learn that the membranes had broken. At 16 weeks, the baby was alive, but there was no amniotic fluid, placing mother and child at serious risk of infection. Termination of the pregnancy was recommended to avoid the risk of infection. As a practicing Catholic, Elizabeth knew she could not choose abortion and she must try to bring the child to term. Isabel, her friend, overheard this recommendation and inspired by her faith, went to the chapel to pray. Elizabeth had prayed through Blessed Gianna before, for the birth of her third child, and was reassured by the inspiration of Blessed Gianna and the Bishop. Several doctors said this was madness as the child was already dying. Her doctor told Elizabeth that Elizabeth’s faith had made her think, and that she, as her physician, also had faith. They would wait for the natural death of the fetus. Elizabeth’s whole community continued to invoke Blessed Gianna for a miracle. Elizabeth had a very difficult time, often feeling abandoned by God. At 32 weeks, a baby weighing 1.8 Kg was delivered by caesarian section on May 31, 2000. She was named Gianna Maria, after her intercessor, and was healthy with the exception of a twisted foot, which was later corrected successfully. Elizabeth had life-threatening complications, but after 3 days in the intensive care unit, she made a full recovery. In July 2001, a paediatrician examined the child and found her to be perfectly normal and healthy, intelligent and lively. In January 2002, a subsequent examination revealed no problems of any kind with the child’s development. “Everything has a specific end; everything obeys a law. God has shown each one of us the way, the vocation, and the life of grace that lies beyond physical life. Our earthly and eternal happiness depends on following our vocation without faltering. What is a vocation? It is a gift from God – it comes from God himself! On December 20, 2003, the decree “super miraculo” was promulgated by the Congregation for the Causes of Saints in the presence of Pope John Paul II. With her spouse and three children in attendance, Gianna Beretta Molla was canonized on May 16, 2004.